September 25, 2011 by Alphageek in "alphageek", "cooking", "equipment"
We started the tailgate in a new way: a new parking lot. We were fortunate to have another parking pass for this game, so we decided to get there early, and see how the other half lives. We found a great space, with plenty of grass to set up the tailgate. We also discovered the coldest weather of the early football season. I certainly was happy that I grabbed a windbreaker before I went to the game. It was just cold and windy enough to make me glad I brought some jeans too. After we set up, we got to cooking. I decided to go with some tandoori chicken that I have grilled at home before. What made today's tailgate unique is that I found some wire skewers on sale at Wegmans. So maybe we talk Wegmans often here, but they sell that stuff in the center of the store, at incredible prices, when the seasons change. We found some great grilling and kitchen supplies, so we bought up. 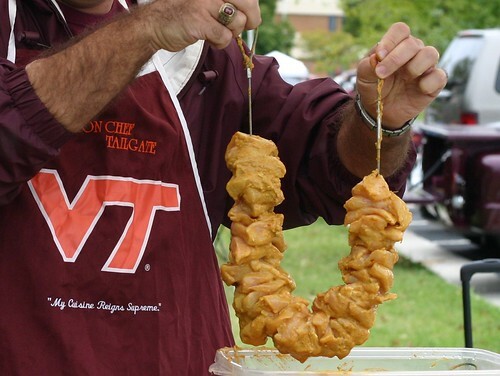 The sale items will make a later post, but for now, we are going to focus on the dish we made for the tailgate. For the tailgate, we were joined by our friend Rob, his wife Barb, and a guest appearance by JJ. You may remember Rob from a previous event, the Raleigh Beer Festival. I prepared tandoori marinade for the chicken. If you want the recipe, you are going to have to post something in the comments to motivate a recipe today. I then took about five pounds of chicken breasts and cut them up into large, bite sized pieces. I also cut up some onion, pepper, and broccoli for some vegetables to eat as well. I placed the chicken onto two of the new flexible skewers. That is right, five pounds on two skewers. 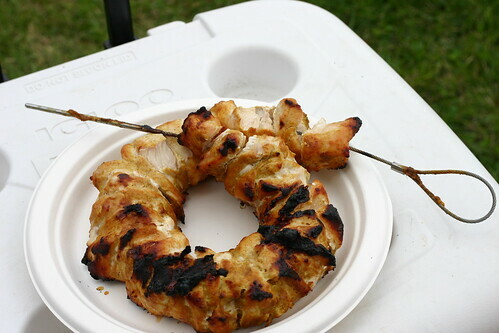 You can see what one of the skewers looks like below. I was very impressed. I will do things in a somewhat different order next time. I should have marinated the meat, and then placed it on the skewers. The marinade had some difficulty getting on the covered parts of the chicken. For good measure, and because I like pictures, below is a picture of the vegetables. 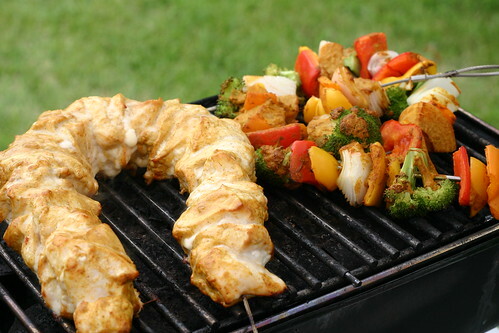 These flexible skewers made it possible to cook a lot of food at once on a little grill. We packed up the grill as shown below, and patiently waited. The new skewers made grilling this a breeze. 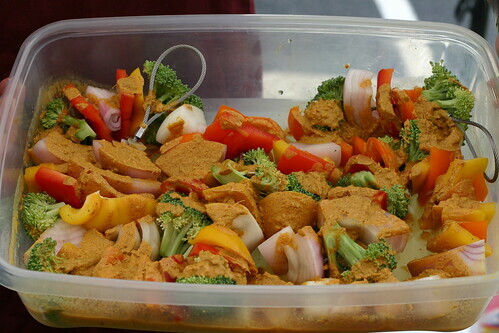 The meat can fit in a variety of containers, unlike when using the old fashioned kind that need an extra long container. We sat around, and enjoyed the grilled chicken, and the company of friends. We ended up grilling and eating everything that we brought, but hey it was the entire day. We would like to thank everyone for coming out and sharing the food adventure with us.